Concern for the welfare, dedication, caring, and love of these wonderful little dogs are what drives us. We accept help in any capacity and would love to meet you. We are an All-Volunteer Organization. With more volunteer resources, we have the ability to save more dogs! 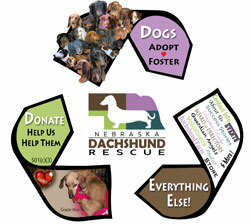 Anything that you do for Nebraska Dachshund Rescue can be considered ‘volunteering’. Adopting a dog, fostering a dog, donating funds, etc... But, saving over 700 dachshunds also requires a lot of legwork! This can include administrative duties, transporting dogs, creative development of materials, checking references, doing home visits...the list could go on and on. If you have some time to give, we would love to have you on our team. Your participation can range from weekly duties or just helping out at a particular event. Aside from the obvious requirement, which is a love of dogs, one other requirement is that you have a basic knowledge of the internet and a working email address. Our volunteer base is mainly located throughout the Omaha and Lincoln areas, but we also have many dedicated volunteers that help from afar. Electronic communication via email, Facebook, and an online calendar is critical to keeping everyone involved and informed. This link will take you directly to our Volunteer Application. It will cover the basics regarding what areas interest you and also contains two documents that need 'e-signatures'...one being the Hold Harmless Agreement and the other is our Code of Ethics. A foster advocate is the caseworker for each dog that comes into rescue. The FA is assigned when a dog arrives into rescue, is the point of contact for the foster family and then helps the foster family decide which family is the best for the dog. The Foster Advocate is the dog's voice while in rescue. Each caseworker is assigned 1-3 dogs. NDR relies on donations to help raise money for vet care. Fundraising could involve sending a donation letter requesting a donation, distributing event flyers, or calling vendors to ask for a donation. If you have an awesome idea for a fundraiser, we'd love to hear about it! We are always updating our website, Facebook, materials, posters, brochures, etc... If you have creative skills you’d like to share, we’d love to put you to work! Do you have teenagers who need service hours? We are a 501(c)(3) non-profit.